Chez Vous Staten Island catering proudly offers the beautiful historic Edgewater Hall for your venue needs, but did you know we offer a diverse selection of menus? While some catering companies only offer set menus with limited selections that may not fit the theme for your event, we offer variety to suit every occasion. Vegan, vegetarian, dairy-free, range-free, and paleo options are available by request. Buffet Menu – Perfect for any occasion and group size, our buffet menu features hors d’oeuvres & salad to start, one pasta dish, two entrées per person, and one side. 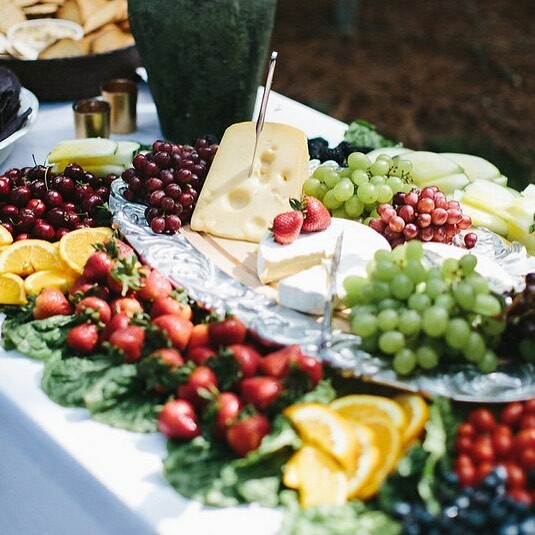 Cocktail Party Menu – Includes our elegant presentation table of succulent fruits, international cheeses, crisp vegetable crudités, and dips plus your choice of eight hot and cold hors-d’oeuvres and any two of our specialty serving stations. Wedding Party Menu–Includes our presentation table plus a pasta bar with your selection of any two pasta dishes, two entrées per person, and one side. Monte Carlo Wedding Menu – Includes a gourmet selection of eight hot or cold hors-d’oeuvres, a pasta bar with your selection of any two pasta dishes, any two of our specialty serving stations, and two entrées per person. Chateau Wedding Menu – Includes our presentation table, a gourmet selection of eight hot or cold hors-d’oeuvres, pasta bar with your selection of any two pasta dishes, four of any of our specialty serving stations, and two entrées per person. Barbeque Menu – With two menu options to choose from, our barbecue menus offer a variety of traditional appetizers, sides, and entrées priced to meet your budget. Specialty Barbecue Menu – Our specialty barbecue menu expands upon our traditional menu and includes Western, Luau, Cajun, and Southern dishes. Sweet Sixteen, Quinceanera, Bar Mitzvah/Bat Mitzvahs Menus – This special menu features our presentation table, eight hot or cold hors-d’oeuvres, a grilled cheese station, buffet dinner with a salad and two entrée items plus one side per person. This menu expands even further with additional add-ons to include upgraded entrées or mocktails and desserts your children and teens will love. Brunch Menu – This menu includes fresh fruits, muffins, Danishes, assorted bagels with a variety of staple accouterments and toppings, coffee, tea or juice, a table-side omelet station with your choice of ingredients, and one additional entrée. Upgrades include a crepe station or sangria and mimosas. Specialty Menu – These additional items can be added to any existing menu and include a seafood station, carving station, Italian pasta bar, Russian caviar, Monte Carlo cordials, Viennese table, bar service, premium open bar, martini bar, and China service. Seafood Menu – Includes steamed lobsters, shrimp cocktail, clams on the half shell and grilled chicken accompanied with pasta primavera, potato salad, corn on the cob, hamburgers and hot dogs. Optional upgrades are available. Vegan & Vegetarian Menu – Includes a wide variety of vegetable crudité with your choice of 3 dips, a fresh fruit display, seven different hors-d’oeuvres & soups, selection of five salads, six entrees, and vegetables, rice, and potatoes. Free range chicken, beef, and fish are available upon request. Paleo Menu– Includes vegetable crudité and fresh fruit, six hors-d’oeuvres, selection of three salads, three entrees, and four sides. High Tea Menu – Assorted scones, muffins, and orange poppy tea bread, strawberries dipped in chocolate, egg salad, and cucumber mint sandwiches, smoked salmon on pumpernickel, lemon cookies, cream puffs, vanilla cheesecake, and English trifle and a wide option of teas available, brewed fresh.